Day 113 of draw an object a day for 365 days. More than 30% through the task of drawing an object a day for 365 days; drawing an average of 6 drawings for each chosen object, over 670 drawings have been produced. These drawings create a visual diary of the objects that surround us. German to English translation book drawing. Drawing of my right slipper. Drawing of a vodka bottle. Drawings of a Waitrose plastic bag. See all of the drawings on my Instgram page, subscribe to see the drawings as they are posted each day. 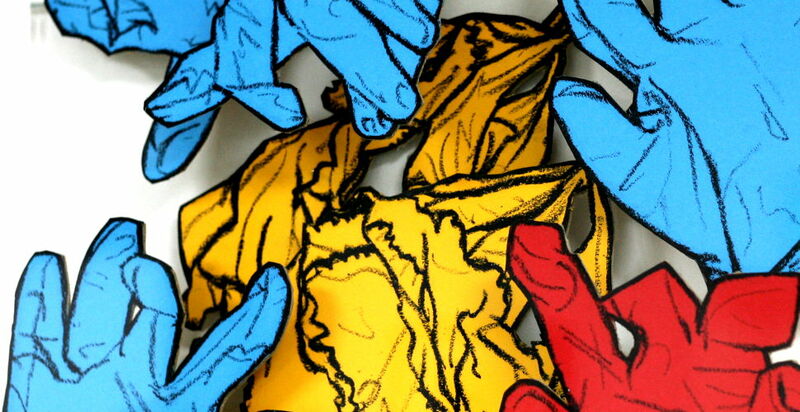 Detail of Latex glove & Leaves drawing. Oil pastel on paper. I have three sets of drawings on display with Art Salon at the Greenhouse gallery; a group exhibition in Stoke Newington, London. These works are taken from my “Draw an object a day for 365 days” series, which is now on day 95. This is a daily diary of drawing everyday objects, that surround me and that I interact with. Drawings of a crab, bought from Billingsgate market. Oil pastel on paper, in box frame. Drawings of a disposable glove and leaf. Oil pastel on paper in acrylic box. Drawings of a glass storage jar. Oil pastel on paper in an acrylic box.